Me and the lads are going to play another A&A 1914 game, this will be the 5th game we played with the same guys. Me and a buddy are CP, i am Germany and he is AH and Ottomans is for both of us. The Allied side have 3 sometimes 4 players. We have won three games in a row with the CP, the last game which was 2 months ago resulted in CP surrendering because my mate had to go to work but in al honesty the CP would have never won this game. The other games they surrendered because they could not brake through our Western lines. Anyway, i want to do a different strategy now. I plan to attack the British navy with all German ships ready, move into Belgium and Poland. no strategy in mind, depending on the situation make some moves. BTW we use a India max 4 placement of troops rule. And the US cant move any ships outside own waters. What do you guys think? A risky aggressive start as the CP? I might need to buy a cruiser/sub or both for Germany and a sub for AH? All these moves are meant to shock the Allied players hopefully. I play with a lot of house rule changes (including the map), because to me, CP is doomed otherwise. SZ12 must be taken to put pressure on Moscow from north. So kill UK fleet round 1 is a no go? Should go take out Russian ship and land troops there? Anything to keep UK off mainland is good. I just never had luck with naval attack - very expensive to press the attack. Going to attack the UK fleet turn 1, built a cruiser/sub or a battleship to bolster my navy again. 80+ views but only one person responding… :? I had not replied as I did not feel I had any certainty to contribute, given that I have less experience of this than other A&A variants, as it is not available on triple A. Anyway - a few comments then …. The first thing to decide is whether CP are going east or west first and then play accordingly. In my own experience the easier path to victory is by going for Russia while delaying allied advances to the west. If going east then stacking Galicia and taking out Serbia in turn 1 become more important. Contested territories tie up troops. Venice still provides an excellent defensive point, so I would still be sending forces there. But the balance is sending as much as possible east. This is particularly difficult for Germany as France builds its army. appreciate it mate of course it helped. A couple of things. 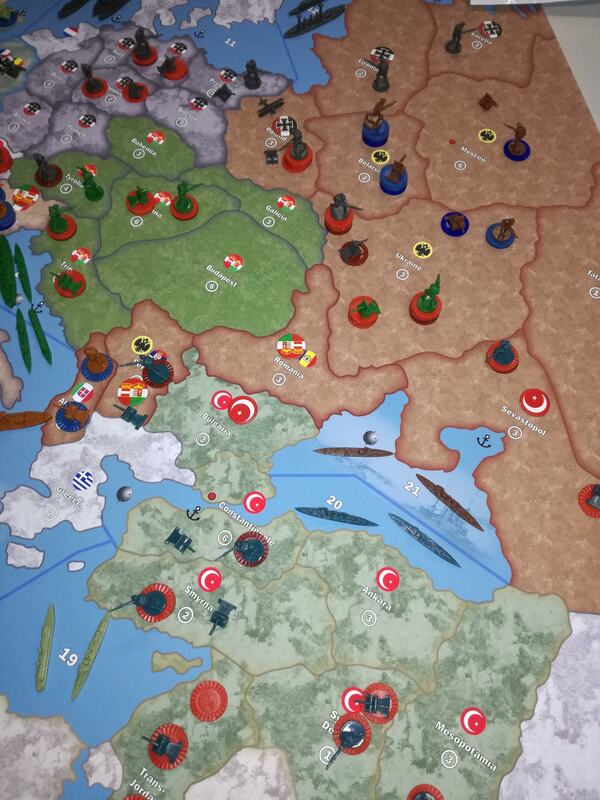 As CP we are going to kill Russia first, so that is the reason i go for Poland and Romania with AH on turn one. With luck i could soften the Russian defences at Poland so Germany can storm in. British fleet is a go indeed, but the other 2 subs worry me. If i use them on my assault on the main fleet they have to get past a mine sea zone right? So if they survive i have more chance to take out the main fleet, but they will still have 2 ships left near Canada… something to think about. I would recommend following the dice. Attacking Poland with AH is not really a good idea because even if you role well, the Russians can still stack enough to make German attack take more losses. Consider attacking Poland turn two with AH instead, either to support Germany or clear the way. As for the Atlantic, I always recommend going for the Canadian transport and cruiser. As you stated, even if going for a big battle with the Royal Navy, those two subs would have to go through two mine zones—that’s four dice at 1. There are some arguments against attacking the British navy, but I prefer to hit both spaces with full force. The dice are in your favor, though be it sort of close. However, I don’t think sending those two eastern subs to the big battle is going to be worth it when you could easily lose one, maybe both to mines. As for the Atlantic, I always recommend going for the Canadian transport and cruiser. As you stated, even if going for a big battle with the Royal Navy, those two subs would have to go through two mine zones�that’s four dice at 1. There are some arguments against attacking the British navy, but I prefer to hit both spaces with full force. The dice are in your favor, though be it sort of close. However, I don’t think sending those two eastern subs to the big battle is going to be worth it when you could easily lose one, maybe both to mines. Will consider the naval advice, thanks de Gaulle. As for the move into Poland with AH, you are right. Might be better to stack up in Galicia where one can move into several territories at once. Well we don’t have a Swiss rule so going to put some troops there so your French Petain will have hard time to focus on three territories. Of course for the plan to work Belgium has to fall in turn 1. Alright, i decided to play solo to see what effect my opening move with AH and followed by GER would have on the Allies. I bought 1 plane, 1 arty and 5 inf for AH. Attacked Serbia with 4 inf and 1 art. Lost 3 inf, Serbia still contested with 2 inf and 1 arty. 2 inf supported with battleship landed in Tuscany, no losses and i gain Tuscany. 10 inf and 4 arty attacked Venice, resulting in 4 casualties and Italy holds onto Venice with 2 inf and 2 art. I attacked Romania with 14 inf and 3 art, managed to kill all troops there and gaining control with 4 losses. Moved Bohemia army to Galicia, moved troops from Vienna to Trieste, Tyrolia and Galicia. Have an IPC of 31 which can be used for another plane or an addition of a ship to bolster the fleet. Russian countermove would involve reinforcing Ukraine, Poland and Sevastopol. No attacks can be made by Russia because the enemy outnumbers him, concentrating on one front would leave another front with less troops. Only logical move would be attacking in Serbia to repel the AH invaders. Germany buys 1 battleship, 1 arty and 6 inf. total of 14 inf and 6 art, completely destroy Belgium forces with 3 losses. Attack main UK fleet, no losses with mines and i destroy the UK fleet with 1 cruiser and half damaged BB left. Invade Switzerland with 5 inf and 1 art from Munich. Successful with 2 losses. Total of 12 inf and 6 art + a plane. Suffer heavy casualties and don’t manage to take Poland because Russia has 15 inf and 6 art there. Russia is left with 3 inf and 6 art vs my force of 2 inf 4 art and 1 plane. A stalemate, but with forces from Berlin to Prussia i should be good next round. 10 inf and 2 art From Berlin to Prussia. Hannover 6 inf to Munich. And move troops in Africa towards each other to unite and become a bigger force. This leaves a shock on the Allied i am sure, they would now have to focus on multiple fronts. UK unable to land forces in France, France now has to focus on Picardy, Lorraine and Switserland so he cant focus on 2 fronts. Italy Roma army has to deal with my 2 inf blocking the way to Venice. Italy could attack Swiss but leave few forces to support Venice. 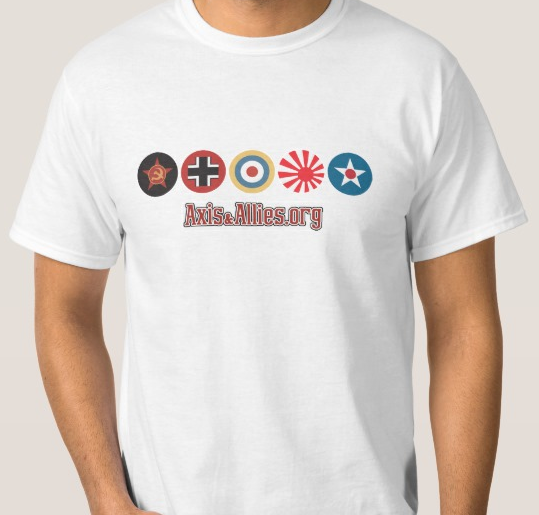 France needs to let Burgundy army stay, move Paris army to support Picardy and Lorraine both. The rest will be tested at the 29th of this month when i play with real opponents what do you guys think? I did have good rolls but suffered heavy in Poland. AH could attack the Russiand in Poland to help Germany. With Austria, you want to stack Glacia. It boarders several Russian Territories, if you have a large force there, it can weaken Poland or Ukraine. Send enough forces to keep control of Venice. Send the remainder to Glacia. If you choose Paris, a Majority of your units will go west. Use your might to crush the French forces. Blow up the UK fleet. Both in SZ 2 and in SZ 9. No matter what, the guys in Sliesia and Prussia will always go into Poland. Should be able to crush France by turn 4 or 5. If Moscow, Build a defensive wall in Belgium, Switzerland, and Lorraine. Dont let the Allies get behind that wall. This one is much easier to pull off. The Ottomans, ah the Ottomans, the sick man of Europe. Keep the British Occupied at all times. Move into the Balkans and secure Greece. Arabia is important, take it to annoy the British. Let Britain Come to you in Mesopotamia. Let them fight the men in Persia. Finally we played the game, we started roughly around 7 o’clock in the evening and stopped the game when the Allies surrendered around 3 o’clock past midnight. I will try to type a after action report as far as i can remember, we played 2 vs 2. My mate played Austro-Hungary, myself Germany and Ottomans we made the decisions together. Other two friends controlled France-Italy-USA and UK-Russia. bought 1 plane, 1 arty and 5 inf. I attacked Romania with 14 inf and 3 art, managed to conquer it with minimal losses. Have an IPC of around 31 for AH. Russia buys mix of inf and art. Does not involve in any combat except Serbia which results in a stalemate with both sides left with 1 infantry. Russia retreats back to Ukraine and Belarus, leaves Poland empty, leaves Sevastopol with 5 units. total of 14 inf and 6 art, completely destroy Belgian forces. Subs attack UK fleet near Canada, i lose both subs with British fleet intact. Attack with all in Silesia and Prussia to Poland which Russia left empty. Send forces from Berlin to West and Eastern front. Allies panic and France buys 2 battleships :? They end up in heavy discussion because realise it was a very bad move. They use transports and move North Africa units to inland Africa because they notice my movement (GER) in Africa. France concentrates its forces in Burgundy and Picardy, leaving Lorraine with a couple of units. UK bought a mixture of ships and troops, invaded Afghanistan, moved troops in Africa, moved troops to Egypt. England failed to move troops to France because of destruction of the navy. bought an arty and a couple of infantry, moved into Bulgaria to get free troops. Moved troops to Jordan and Mesopotamia. Italy unlocked Albania, moved troops to Egypt. Took back Tuscany. America just bought ships and troops. 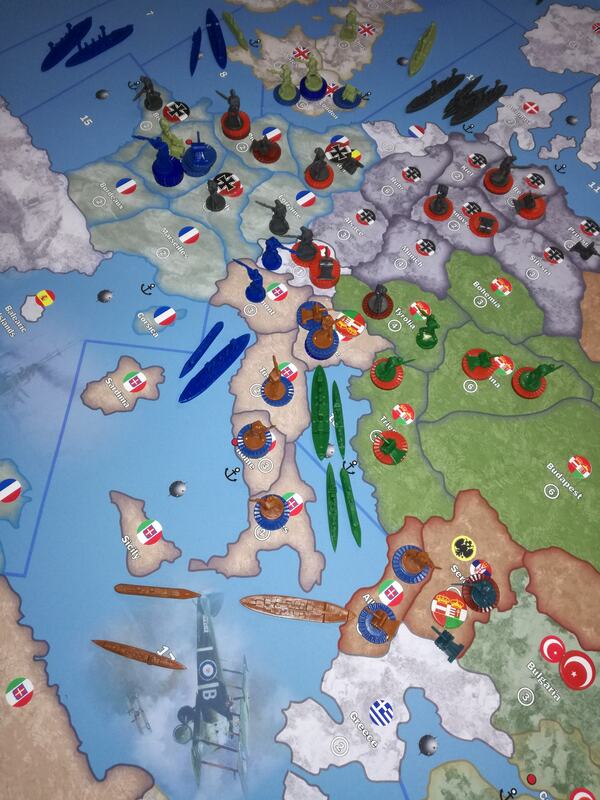 Turn 1 ended very good for the Central powers, my opening moves discussed in earlier posts have prove quite successful. It took the Allies completely by surprise and resulted in making bad decisions despite being good tactical players. I even managed to sunk a fleet of 3 transports and a cruiser with 2 subs taking no losses. Submarine warfare is great to inflict casualties on the UK and France if possible, always look for opportunities to buy ships. At turn 3,4 and so on i had 50+ IPC, i could spend cash on planes, ships. I even managed to built a battleship fleet consisting of 5 ships with Germany! 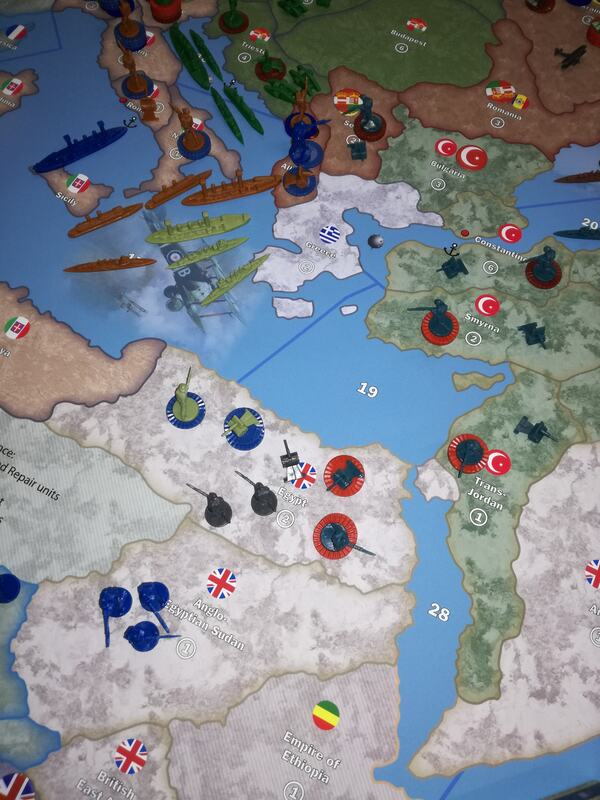 Ottoman Empire was on the offensive towards India and Egypt, so even with American help the Allies would not be able to achieve total victory as Italy was about to be invaded again. As always feedback is welcome and appreciated, i will gladly explain in detail if needed. I’ve never played 1914, but I did read your report… so you played for 8 hours and the Allies surrendered at the end of Turn-1? That’s a long turn… or did you just post how turn-1 went, but you played a lot more turns than 1? Having never played this game, i’m not sure how things go turn-wise. It should only take an hour to do a full round. So he must have done much more. they surrendered at around turn 6/7. I only wrote down the actions of turn 1 because the major difference was the tactic i had written down for the Central Powers. It was for me a moment to test the opening moves, in my opinion this kind of opening tactic will surely get victory. I figured I must have missed something! 6 or 7 turns in 8 hours sounds a lot better than 1 turn in 8 hours! Now it all makes more sense! I love WW1 history almost as much as WW2 history… but dang, there’s only so many hours in a day… our group stopped playing Global because it was too time consuming and we switched to “mini global” (aka: Anniversary Edition). You should really try out this wonderful game, me and 3/4 friends play this game on a regular base like once in a month. However we said it is time to change teams/factions because we have played 5 times as Central Powers and won 4 of it, they only win once. Excited to play as the Allies they do have a good starting point because they know the Axis tactics thanks to us. Anyone want to try out my first round of CP tactics? I had a great experience and would love to hear your stories. Glad to hear you had a good game. I also love 1914, in particularly finding the differences to reflect WW1 conditions fascinating. Has anyone tried my tactic page 1 and 2? @Jocher: 1 - Tanks.Â Can someone explain tanks to us in detail?Â They attack at 2, defend at 1?Â They soak up hits?Â How?Â We didn’t understand tanks at all and haven’t used them yet due to this fact.Â Please help if you can. Tanks attack at 2 (3 when supported by artillery) and defend at 1. When attacking (not defending), each tank cancels one hit scored by the defender. However, tanks may not cancel hits scored by pre-emptive artillery strikes while performing an amphibious assault. @Jocher: 2 - Army Movement.Â Example -Â I am playing as Germany, and I have let’s say 30Inf/20Art and I move them in to hostile French Territory which houses 30Inf/20Art themselves.Â We duke it out for that round (Germany attacks, France defends) and the territory becomes contested.Â After the initial attack, both Germany and France go down to, let’s say, 20Inf/10Art each.Â Now it’s France’s turn.Â #1 - Does France have the choice to NOT defend, and instead retreat all their armies and give the territory to Germany? France has the option to not attack. A power is never the defender on its own turn. It may reinforce the territory with more units, or withdraw some or all of its units. Any units in the territory may then attack, or they may do nothing. 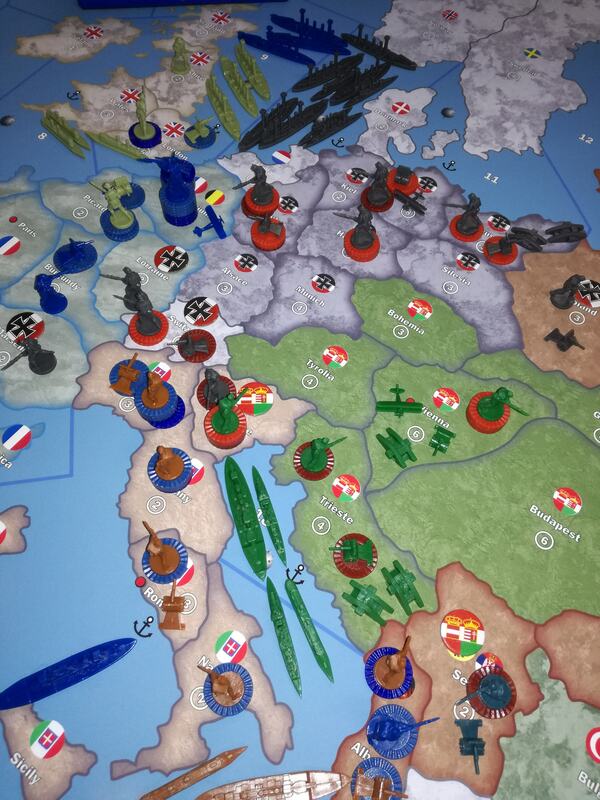 @Jocher: Now let’s say France decides to fight.Â After France defends, the armies are both split evenly at 10Inf/5Art.Â Territory is still contested.Â Next turn is Germany’s.Â #2 - As Germany, can I move my 10Inf/5Art closer to Paris?Â Or must my army stay in the territory until no more hostile units are in it? When units move out of a contested territory, they must move into a territory that either was controlled by their power or contained units beloning to their power at the beginning of the turn. Germany may move its units closer to Paris only if those conditions are met. @Jocher: 4 - If I am Germany and just took Rome, the next round am I allowed to muster units in Rome, or do the Allies/CP ONLY muster units in their capital and NOT in captured capitals? You may only mobilize land and air units in your own capital (or in India if you’re the British Empire). You may only mobilize sea units in sea zones that have a naval base located in a territory that you originally controlled (has only your powerâ€s emblem) and was not under enemy control at the beginning of your turn. I need to do some reworking based on games this summer, and then get them into a form suitable for sale. Where to get this game? Is this game too expensive? Well they could have mixed some in. My biggest gripe is the lack of artillery sculpts. Just swap them all around. Like give France the Italian sculpt from 1940, and give Russia the Japanese sculpt, etc. Just recolor the old molds. Better than one cookie cutter artillery. Great replies, guys. I agree and concur with them all.